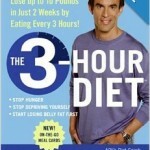 The 3-Hour Diet – So is this another one of those FAD diets? SO IS THIS ANOTHER FAD DIET? It may very well be, but this book seemed to COLLABORATE what my body has been telling me all along! It actually says that you should be eating every 3 hours, and this will Boost your metabolic rate, Stop hunger, and start Losing Weight just by eating every 3 hours. But best of all, at least for me, it will start with losing your BELLY FAT first! Well, that’s what the author promise. He gives a breakdown of what’s banned, and why the diet is dangerous. Oh by the way, he is an opponent of the now familiar low-carbohydrate diet that was also once a huge craze. He listed many reasons why low-carb diets actually make one FAT. You can read more about this in his book “The 3-Hour Diet”. SO, the conclusion is that his 3-hour diet is the best alternative as you can have almost every food you desire and is easy to sustain. It does not deprive your body of the foods you like. But if you boil it down, it’s simply having a BALANCED meal (hello, that is taught in school, remember the food pyramid?) So you are supposed to have carbohydrates, proteins and lots and lots of vegetables, and a little bit of fat. The author uses an interesting visualization method to help us remember the different food groups and how much one is supposed to have at one sitting. I have to say, it is quite useful visualization technique and I even found myself looking at the rice (ie carbohydrate) on my plate and wondering if its the size of a rubic cube! Among the benefits, it is supposed to up your basal metabolic rate, and increase your energy levels as blood sugar in your body is kept stable, which incidentally translates to fewer cravings and hence a natural way to suppress appetite. Got it? But what really got me excited was the final benefit … Reducing the belly-bulging hormone Cortisol. Cortisol is a stress hormone that is closely related to abdominal fat. Jorge cited a study in The New England Journal of Medicine that showed how eating every 3 hours in fact helped to reduce the levels of cortisol in humans. The study found that individuals who ate frequent, small meals actually reduced their cortisol levels by 17 % compared to those who took 3 large meals (even though both groups consumed the same amount of food). The 3-Hour Diet – How Much Should I Eat? The 3-Hour Diet – Why 3 Hours? Can’t I Eat Whenever I Feel Hungry? The 3-Hour Diet – Eat to Lose Weight. Does it really work?